There is no way to recover from these kinds of exposures. There is no medicine and there is no cure. Millions now possess a shortened life span due to their radiation exposures. READ AND SHARE THE ENTIRE ARTICLE HERE. 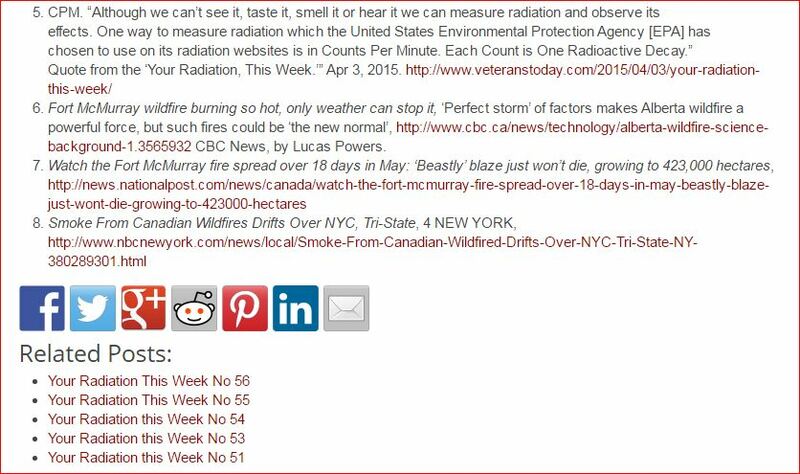 Heavy duty sources this week in Rad include: nuke product fires in Northern Canada   ; undeclared nuclear wars in Central Asia; Fukushima in Japan; and, 438 big nuke reactors leaking non-stop, all the time worldwide. There are approximately 104 operating reactors in the States. The number varies with reloading and repair schedules. Bob Nichols Said WHAT ELSE?!? Brought to you as a Public Service Message via Lucy Occupy and Friends. Have a nice day. #DodgeTheRads. Call for War Crimes Trials!